"Stout’s aviation expertise sorts fact from fiction and drives to the bone and heart of the fighter pilot in World War II"
In this follow-up to his award-winning The Men Who Killed the Luftwaffe, Jay A. Stout focuses on one of the best and most decorated American fighter groups of World War II. 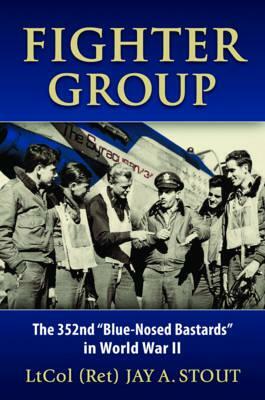 Stout combines the storytelling gifts and meticulous research of a seasoned historian with the combat experience of a former fighter pilot to tell the remarkable story of the USAAF's 352nd Fighter Group, the "Blue-Nosed Bastards of Bodney." By war's end, this group of pilots--an assembly of true American characters--had flown 420 missions, logged nearly 60,000 combat hours, destroyed 776 enemy aircraft, and produced 29 aces, including George Preddy, history’s top scorer in the P-51 Mustang. Stationed at Bodney, northeast of London, England, for most of the war, the 352nd Fighter Group flew as part of the famed U.S. Eighth Air Force, primarily as escorts for the B-17 and B-24 bombers that pounded Germany. In the process, the group's P-47 Thunderbolts and P-51 Mustangs struck crippling blows against the Third Reich's fighter force, helping to render the Luftwaffe incapable of defeating Allied bombers and protecting the homeland from devastation. Drawing on interviews with veterans of the 352nd Fighter Group, their letters home, and the unit's after-action reports, Stout reconstructs the experiences of World War II fighter pilots, from boyhood dreams of flight to wild dogfights in which milliseconds made the difference between life and death. This isn't just the story of a single fighter group; it's the story of how the United States won the air war over Europe.